A top down boss fight puzzle adventure. In an interview, the director of Dark Souls Hidetaka Miyazaki once referred to a game’s health bar as the character’s ‘will to live’. The lower the bar, the more determined and desperate a player will become to stay alive in those split seconds. Anyone who has played Miyazaki’s masterpiece knows this feeling all too well—you’ve been flattened by some horrible boss, you can’t just cure because you’ll be killed instantly, so you’ve just got to get in that one pixel perfect dodge on the enemies next attack and you’ll have a window to cure yourself. Time to test your nerve! 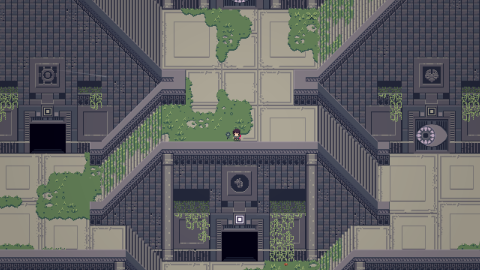 Titan Souls is a game about that moment. That frantic scramble to keep yourself alive, whilst trying to finish off whatever it is that is trying to finish you. It began life as the product of a game jam based around the concept of having ‘one thing’. You cut about a world map, tracking down these Titans and putting them on the end of your singular arrow, which when fired, can be returned by holding down the button and it flies back to be used again. The Titans can kill you in one hit but in turn, one perfectly placed arrow to their weak spot will kill them, too. This full game keeps that core mechanic, but instead of four Titans, there’s now twenty of them, all scattered across a substantially bigger world. Your only goal is to find them and kill them. Pretty straightforward, but far from easy. You see, Titan Souls is a pretty tough game and you’re going to die a lot. A Titan can kill you almost immediately upon picking a fight with them, as they attack relentlessly once you’ve awakened them. Death gets you dumped back at the last checkpoint passed, ready to go again. That’s your only punishment—a bit of a walk back and another 1 on the total number of deaths that mocks you on the file select screen—other than that, death is merely a lesson here. A ‘watch out for that’ or ‘don’t try that again’, for instance. Every Titan you encounter needs to be figured out. They’re all individual action puzzles that work with that core mechanic of being able to fire and retrieve your arrow. Each one has its own unique way of attacking and a unique way for you to deliver the killing blow. Some are fairly straightforward, like just waiting for a gap between attacks where its weak spot is exposed then firing an accurate arrow into it, while some require a bit of work before you can attempt the coup de grace, with a few different pieces of the puzzle needing to be solved before their weak spot reveals itself. You’ve got to keep your nerve and fire that one perfect shot to finish the Titan off, each one of them designed so that you’re always under pressure at the point where you must release the killshot. One arrow, one shot away from victory, one hit away from another crushing failure. What a victory it is, though. When you land that perfect shot, accentuated by a single cymbal hit, everything freezes. The music stops, the colour fades from the game and you’re left for a few seconds to take in the fact that, against all the odds, you did it. There was nothing cheap, no gaming the system or finding an easy way to do it. You figured out the Titan, usually over a considerable amount of attempts, exposed the weak spot and landed an arrow smack bang in the middle of it. You did it. You’re a bloody hero. Time to pop that arrow out, absorb the Titan’s soul and get searching for the next one. Onwards until you’ve bested all twenty and then, you’re done. Once you’ve figured them all out that first time, the magic is gone—killing one for the second time just isn’t anywhere near as satisfying. There’s also little to do outside of the battles with the Titans, save for a few puzzles here and there as you track down some of the hidden bosses, which is a touch disappointing. Upon repeated deaths, it gets a bit tiresome having to trek even the few screens to get back to the boss, rather than having a Hotline Miami style quick restart. Unless you get into the unlockable hard mode or the time attack stuff, there’s no real reason to revisit after you’ve been through once. That first time though, when you’re swapping strategies with other players, trying to figure out how to best these Titans, is fantastic fun. Like the best bosses, they’re a true test of your abilities and Titan Souls is twenty of these challenges. It is a shame there aren't a few more.